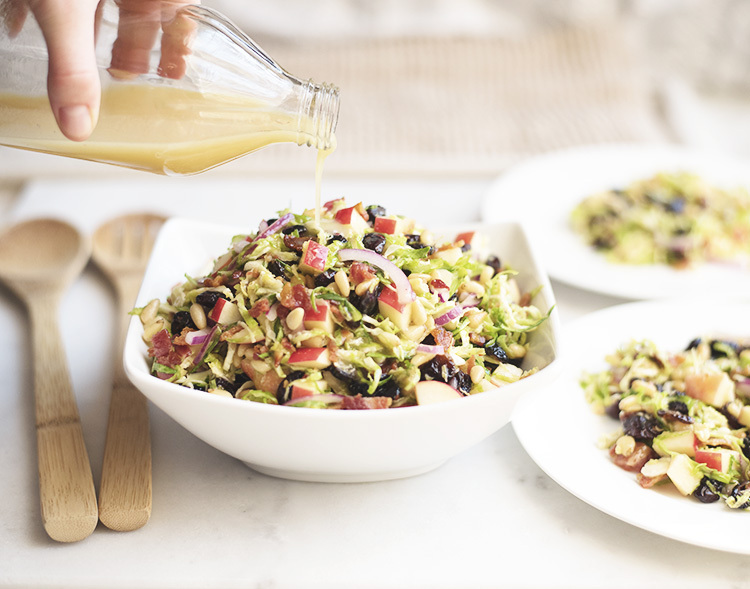 This salad is overflowing with flavorful, healthy goodness! The sweet and salty combo paired with the crunch from the apples, pinenuts, and onion is sure to be a crown pleaser. It's the perfect side dish next to your typical, heavy holiday dishes since it delivers a light and fresh taste. The finger-licking dressing adds just enough tasty flavor to the salad to keep you coming back for more. Free of gluten, grains, wheat, corn, soy, dairy, eggs, refined sugars, refined oils, and artificial flavors. 1. Cut off the ends of the brussel spouts. 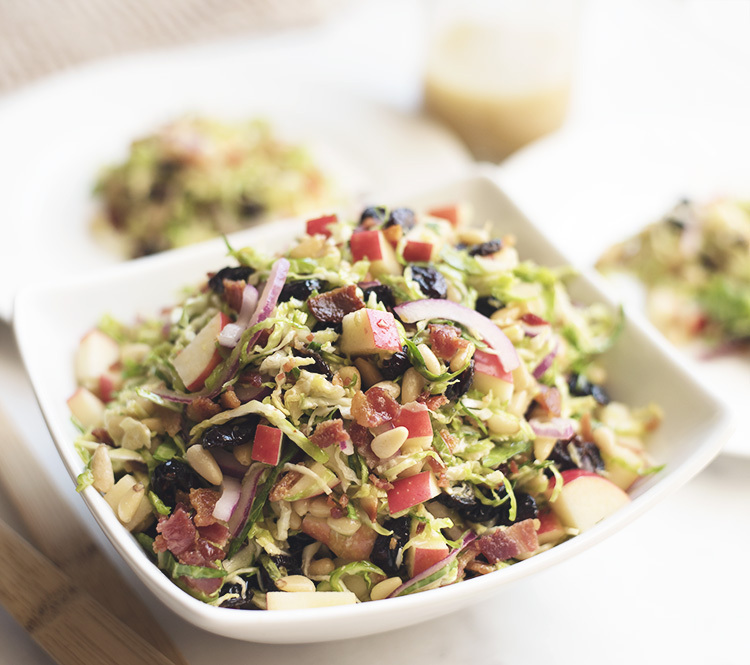 Using a knife or slicer, create thin slices with the brussel sprouts. 2. Slice the onion in a similar thin size as the sprouts. 3. Place the pine nuts on a small skillet over low to medium heat. Toast, stirring often, until pine nuts are fragrant and light brown, about 2-3 minutes. Once toasted, pour into a large mixing bowl. 4. 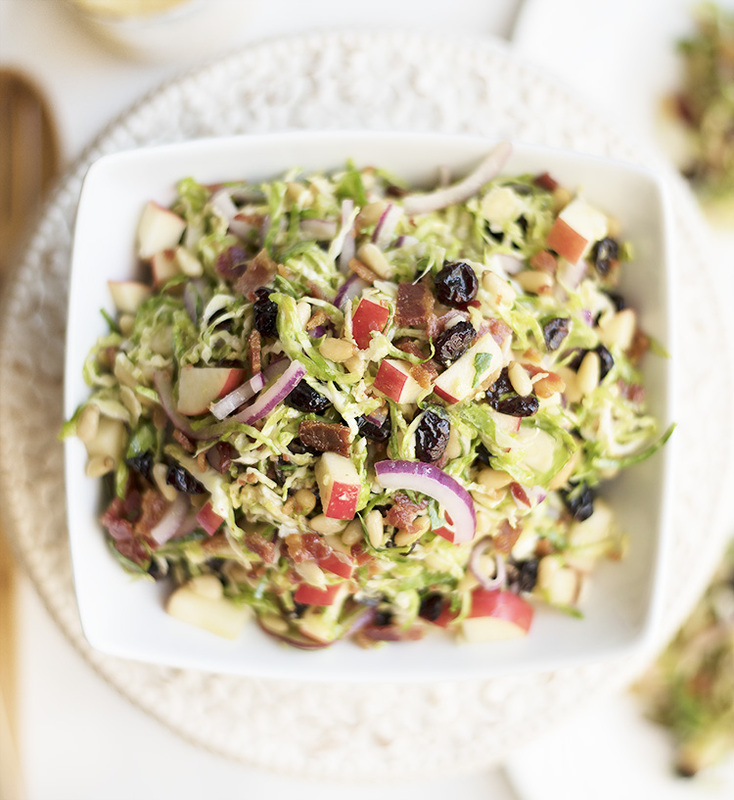 To the bowl, add the shaved sprouts, diced apple, cranberries, crumbled bacon (if used), and sliced onion. Stir to combined. 5. Add all dressing ingredients to a separate mixing bowl and whisk well. Pour dressing over salad and toss to coat. 6. Place salad in the fridge for at least 1 hour. Serve and enjoy! I want to eat this now! Thanks for this recipe! I'm definitely making this for the holidays and probably before. Sounds and looks delicious. Can't wait to try!